After 254 km the 111th edition of Paris-Roubaix was decided in a duel on the concrete Roubaix velodrome between Fabian Cancellara (RadioShack Leopard) and Sep Vanmarcke (Blanco). Positioning himself behind Vanmarcke, Cancellara sprinted for the line, taking the win by a bike length and making it three Roubaix victories. “I was in another world of riding! I still don’t know how I did it. I was dropped and pretty far back but then I started to move up. This is a race you can never give up on until the end. I had to play with him in the end because I tried to go away but he followed so then I knew it was man against man. I’m happy for the team and for me. Now I look forward to rest and a holiday. 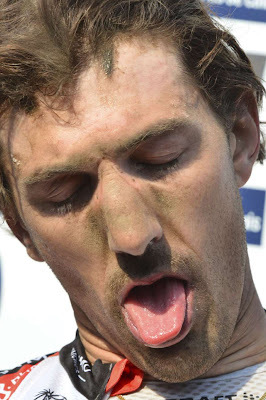 Mission accomplished,” said Cancellara. "It’s amazing having a third victory. When I see how in this race everyone was against our team, against me, I just had to do a selection. The team came into a little bit of difficulty because we lost a few guys because of bad luck. But that’s Roubaix. It’s always nice to win alone but today there was pure fighting until the very end. I could not believe it when I crossed the finish line. My legs and my head wanted to bring me here."